MAKE SOME CROCHET BELLS AND SNOWFLAKES! FREE TUTORIAL RECIPE FOR BATH SNOWBALLS! I'm sorry that I'm not much of a crocheter (is that even a word?) - my skills amount to a few dodgy looking practise granny squares at the moment! I MUST practise more! I may be able to make something like this then! 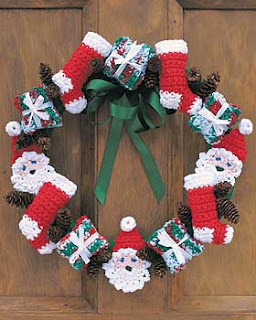 This beautiful crochet Christmas wreath from Fave Crafts is just one of a free downloadable ebook of crochet Christmas wreaths. There is also a Candy cane crochet wreath, a Christmas Bells crochet wreath, a small Christmas Wreath decorative pin brooch and a small crochet wreath decoration. I love them all because they all have that sometimes rare quality of looking professional, whilst also looking hand-crafted.